Hello Everyone! I hope you all have had a wonderful Christmas and New Year and were surrounded by friends and family! Thank you for all your continued support financially and through prayer. As I reflect on this past year in ministry, I am so grateful and overwhelmed by just how good our God is and how much He is doing on our college campuses. Being at SMU this semester has been quite a challenge at times, but I have found the words of Paul ringing in my ears in 2 Corinthians 12:9 that says, "But He said to me, 'My grace is sufficient for you, for my power is made perfect in weakness.' Therefore I will boast all the more gladly about my weaknesses, so that Christ's power may rest on me." I have found that when I am at my lowest strength, God has done amazing things, showing me slowly that His power IS made perfect in weakness. And that I don't have to be strong on my own. The other apprentices! I couldn't have made it through without them! We had our end of the year Christmas Study Party the week before finals. The students had a blast! We had an upstairs area that was the quiet study area and the downstairs was a spot where students could grab a snack, take a study break and play games with us! We had such an awesome turnout and so many students remarked about how much fun they had. This was such an amazing way to bless our students and was an opportunity to meet new students on SMU's campus. There was a moment during this time where we were playing board games and students were laughing and joking with each other that it hit me just how special this all was. So many students, especially around finals, spend their time anxious, alone and just trying to make it through. But here were a group of students being able to laugh and enjoy being with one another and enjoying the beautiful joy of fellowship that God has given us! How amazing that we get to participate in this and invite college students to experience the love of Christ through one another! Students hanging out at our Study Party! We also will have Winter Camp coming up in January. This is the biggest thing we do in FOCUS, for a very good reason. Winter camp is a 4 day retreat the weekend before Martin Luther King Day. We take students from every FOCUS campus in the DFW to Sky Ranch and spend time worshipping and learning about God together, spending one on one time with students and building close relationships among our campuses. Winter camp is such a huge way that students come to feel closer to those in their cores (small groups) and to others in the ministry. 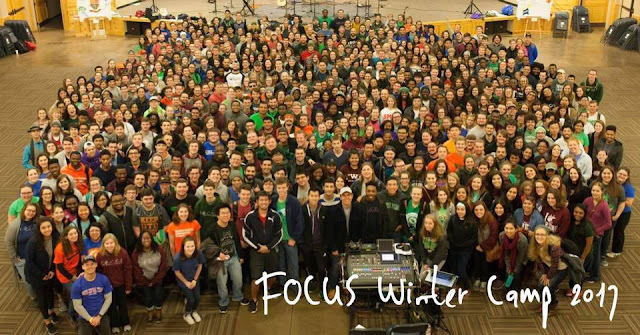 There have been so many students who after Winter Camp, have really jumped in and fully invested in FOCUS, including me! I can honestly say that my view of Christian community and what discipleship means to me changed drastically after Winter Camp, and for the better! Winter Camp from a few years ago! I can't wait to see what God does this year! Thank you so much for all of your continued support. I am so grateful for each of you and your passion for college ministry. I pray that going into this next year, each of you would draw closer to Christ to know and love Him more! That Christmas Study Party is such a great idea! Students definitely need a break from intense studying around finals time, and I'm glad you could provide that with some friendship and board games. I am praying that Winter Camp would be a life-changing time for people to come to know God better!